Mark Russinovich is a Technical Fellow in the Windows Azure group at Microsoft. He is coauthor of Windows Sysinternals Administrator’s Reference, co-creator of the Sysinternals tools available from Microsoft TechNet, and coauthor of the Windows Internals book series. 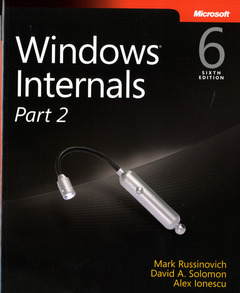 David A. Solomon is coauthor of the Windows Internals book series and has taught his Windows internals class to thousands of developers and IT professionals worldwide, including Microsoft staff. He is a regular speaker at Microsoft conferences, including TechNet and PDC. Alex Ionescu is a chief software architect and consultant expert in low-level system software, kernel development, security training, and reverse engineering. He teaches Windows internals course with David Solomon, and is active in the security research community.